There’s only one thing that’s powerful enough to drag me out of my six month blogging hiatus. Something small, magical, inspirational, strong, filled with light and with connections so strong it changed me to my core. Don’t know what a Fitbit is? Oh, well, I apologize you’re living in 2014. Quick – look at the website and familiarize yourself. Or better yet, keep reading and let me paint you a picture with my ridiculous words. For Christmas last year I was gifted a Fitbit Zip. It’s just a little guy that you carry around in your pocket and count your steps. Standard pedometer style.Since it was received with a new ski helmet and goggles, naturally I wanted to take it out for its first spin on my trip out to Breckenridge. Plus, talk about going big or going home… I was going to DOMINATE my step goal. 10,000K you’re TOAST! All morning I ski. And ski. And ski. I don’t want to say I was sweating bullets when I sat down for lunch – but I probably had one million steps. I sit. Check my Fitbit… and it tells me I’ve been active for like 4 minutes and had 1,000 steps. Which looking at rationally sitting here on my bed typing this in the warm comfort of my temperature controlled room – I get. I mean, skiing is gliding. I understand now. That makes sense. And that was the end of my Fitbit for months. I thought nothing of it. Until I notice a girl at work swinging her arm like a crazy person and taking lots of walks. And I see the band on her wrist. It’s a Fitbit Flex. Which I’m fairly positive my brothers got for Christmas and had yet to remove from the box. I won’t say that 50% of the reason I was interested in this option was solely because Tory Burch had decided to sell stylish accessories… that would be silly (Ahem… shop here). I nicely asked my brothers if I could temporarily (forever obviously) borrow their Fitbit to see if it was something I was interested in and one (lucky for you blog readers) obliged. I get it out of it’s packaging, put on this rather ugly looking bracelet, sync it to my phone (thank you 2015 technology, you’re so snazzy), start swinging my arms 90% more when I walk and that was that. Until one day, when as I’m browsing around the app, I realize I could invite people into a step off. That’s right – step off. You simply invite your friends and see who can get the most steps from Monday to Friday. But this step competition? Changed. Me. To. My. Core. All of a sudden, second place wasn’t good enough in this competition against co-workers and friends. I was walking to EVERYTHING. No joke – I thought about exercise all day errr day. People in the competition were simultaneously encouraging and taunting the other participants. Sitting wasn’t an option. I paced the hallway on phone calls. I found myself taking my allotted 15 minute walk breaks at work. I passed up lunch invites so that I could spend extra time in the day walking. I WENT TO THE GYM FOR FUN. By the time Friday night rolled around, there were a few people fighting for the top spot. I was still in the running and victory was a mere 7,000 steps away. Only problem? I was headed to North Platte for a romantic getaway with the love of my life that I hadn’t seen in three weeks. Sure, most people would never look at that as a problem. They’d be delighted. But I was in a crazy step challenge daze. Should I have attempted to look my best for my guy? Probably. Should I have planned some fun outings? Absolutely. But all logic was out the door. The only thing I could focus on was how to squeeze in more steps. I knew The Boy was an hour behind (time zone wise) and wouldn’t be able to leave work for an hour after me. So I did the only natural thing in this situation, I ran home, changed into grubby workout clothes and started walking… waiting for him to call so that I could quickly walk home and hop in the car. Sweaty clothes and all. Because what better way is there to drive four hours. And that resulted in three blissful extra miles. Which really, only made everything worse. I was so close to winning. So close to victory I could taste it… and yet… I was stuck in the car for the next four hours and out of time. Or was I? I arrive in NP, call The Boy to check on his progress, turns out he (unhappily) hit a hail storm that slowed him down and was going to be an extra hour. And then friends – I did something that I have never done before in my entire life. I checked into the hotel, threw my bags on the bed… and ran right down to the gym at the hotel to hop right back on the elliptical. At a hotel. On a vacation. And there I stayed until The Boy arrived. Yes, it was nearly 11pm. Yes, he wasn’t all that thrilled that he showed up and I was a breathless sweaty mess. Yes, I am out of my mind. 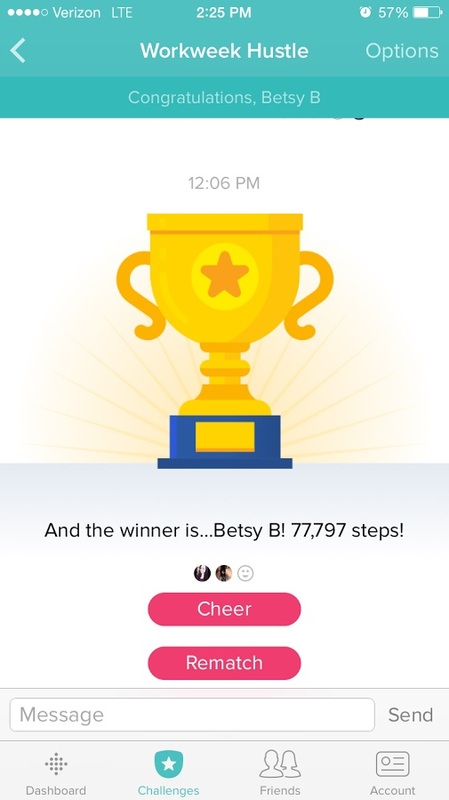 … but most importantly… YES I WON THE DAMN STEP CHALLENGE. 77,797 steps in five days. I’m simultaneously proud and terrified of myself. I won because other people went to bed at a rational hour… or did something fun on a Friday night. Nope. Not this girl. She just kept walking! Arms swinging, calves cramped, walking. Like the true lunatic she is. So do yourself a favor and get yourself a Fitbit. Then invite me into a challenge. And just try to beat me. I dare you. Very interesting. I don’t have a Fitbit, but I use MapMyRide for bike rides. I don’t intend it as a challenge, though: I’m just interested in it for personal effect. But congratulations on your win!